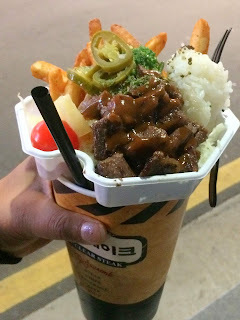 [Seoul - Hongdae] Nuclear Steak 핵스테이크 - Steak, rice, fries, and cola/beer all-in-one! 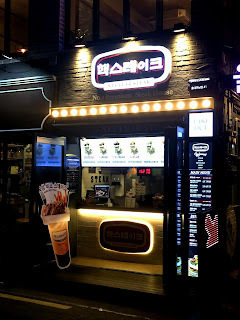 I finally tried Nuclear Steak 핵스테이크 in Hongdae, which has been around for a couple of years now. 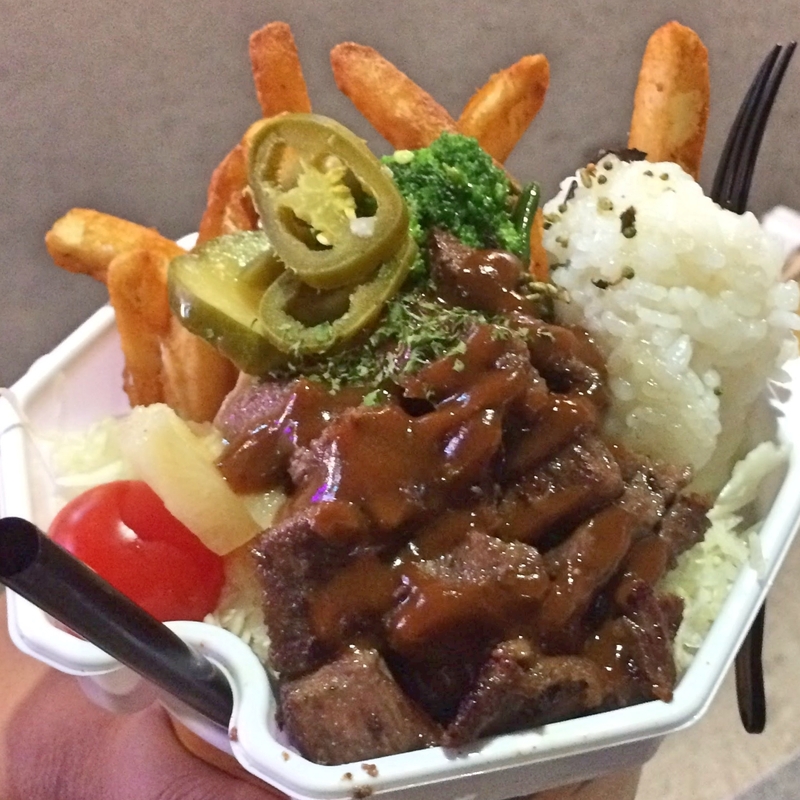 Have you tried the steak version of colpop yet? (For the uninitiated, colpop is fried chicken in the bowl-lid of a large ginormous cola). I got the aging beef steak (I personally wouldn't have gone with 'aging' as the name of the menu item, but it is what it is). We actually swapped out the cola for draft beer just because we thought it was kind of unique, but you can definitely just keep the cola (or Fanta or cider) if you prefer. 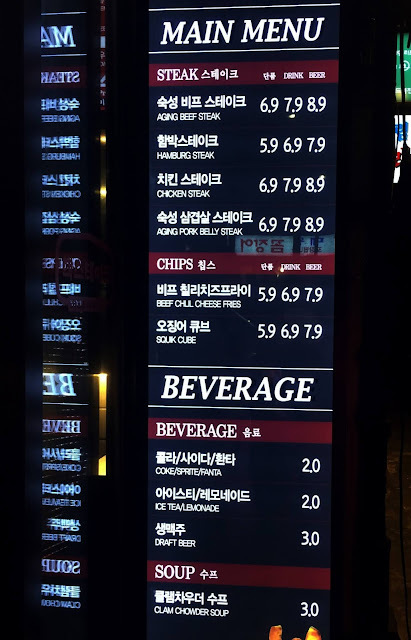 It's actually kind of a lot of food, but obviously with those prices, it's not that much steak. There's a scoop and a half-ish of white rice, some seasoned crispy french fries, and then a tomato and a few slices of jalapenos for some added color. Pro tip, eat the fries first so they don't get soggy or cold, but I'm sure you know that already. 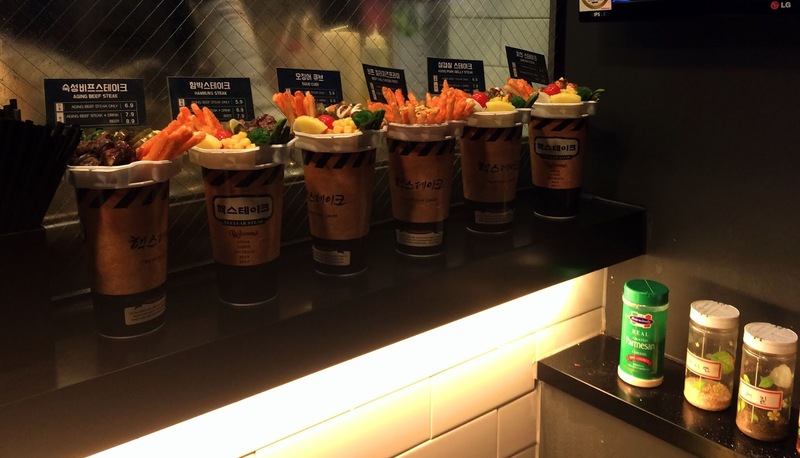 Bottom line: This is kind of a smart idea for the Hongdae area. It's takeout only, so a lot of people go to the little walking path/parkish grassy area across the way and eat it. I probably would not get it again, but it was an interesting concept. They have some samples so you can kind of see kind of what you're getting before you order. This is the menu! If you order the "SINGLE" 단품, you will get JUST the food. It comes in the cardboard boat box thing you see in the picture, just to clear that up. There's beef steak, hamburg steak, pork belly (samgyeopsal), chicken, and squid options. You can also opt for the beef chili cheese fries. 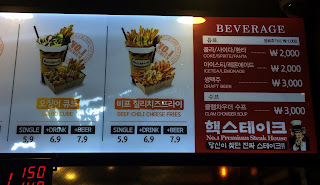 Even if you get the beer version (which is 1000KRW more than the cola option), any order is less than 9,000 KRW. The beer price is actually pretty cheap if you were somehow super jonesing for some draft beer to sit in the park. I would probably recommend staying away from the clam chowder, but if you've been brave and tried it, let me know what you think.